By the time the last gavel came down early in the morning of November 18, international climate negotiators in Bonn paved the way to the next climate summit in Katowice, Poland in 2018. There, the rules underpinning the Paris Agreement will be finalized and countries can signal their commitments to enhance national climate plans by 2020. Encouraging news on the sidelines of the negotiations added helpful momentum. New WRI research found that 49 countries have already peaked their emissions. A new coalition of countries pledged to phase out the burning of coal by 2030, or never start in the first place. The world’s biggest sovereign wealth fund, based in Norway, offered a proposal to divest from oil and gas holdings, which could have significant ripple effects. The Kigali Amendment crossed the 20-country threshold for entry into force, under which all countries have agreed to replace hydrofluorocarbons (HFCs), powerful greenhouse gases, with climate-safe alternatives. Despite the Trump administration’s stated intention to pull the United States out of the Paris Agreement, American businesses, cities, states and others showed up to give a full-throated endorsement of climate action. And there was a vast array of initiatives showcasing climate solutions for all levels and sectors. But while we can celebrate this incremental progress, trends in global emissions show we are not on track to avoid the most economically and environmentally devastating climate impacts. According to a new report, greenhouse gases from human activities will reach their highest levels yet this year, after three years of flatlining. Around the world, we have yet to make the comprehensive economic and societal shifts – from how we power our homes and build our cities to how we feed our families and move around – needed to keep climate change in check. We are still nibbling at the edges of this monumental challenge, and the clock is ticking. Given that, countries will need to bring added energy in 2018 to complete the rules for the Paris Agreement and send clear signals that they will strengthen action in their Nationally Determined Contributions (NDCs) by 2020. Negotiators made headway on the rules and procedures underpinning the Paris Agreement. To finalize the Paris rulebook by next year, countries must intensify efforts and carefully navigate topics such as transparency, accounting of emissions and finance, and the process for raising ambition over time. At Bonn, the most progress was made on the sensitive issue of transparency. Over the coming year, negotiators will need to balance providing flexibility to developing countries that need it because of their different capacities, while still ensuring all countries are guided by the same principles for improving their data overtime and providing the predictability that countries and markets need on climate finance. Negotiators still need to find areas of convergence on how they can take stock of their climate efforts every five years, including how to address equity issues in that process. The Paris rulebook will need to rise higher on countries’ political agendas to ensure we achieve clear outcomes in 2018 that will advance a level playing field for all countries and provide the market signals needed to help underpin the transformation to a low-carbon, climate-resilient world. After intensive consultations, the Fiji Presidency unveiled a roadmap for the 2018 Talanoa Dialogue, a year-long process to assess collective progress and identify opportunities for countries to strengthen action. The Talanoa Dialogue is a first step in the cycles of progressive ambition taking place every five years, which is a core feature of the Paris Agreement. Jointly led by Fiji and Poland, this process will include a preparatory phase starting in early 2018 and culminate in a political phase at the ministerial level during next year’s climate summit. The roadmap highlights the importance of setting clear, forward-looking signals to inform more ambitious NDCs, which are needed to decrease global emissions. The Talanoa roadmap also includes an important role for other actors including cities, businesses, unions, faith and civil society groups, as well as global, national and regional events throughout 2018. The climate summit hosted in 2013 in Warsaw, Poland was the birthplace for NDCs. Thus, throughout 2018 and during COP24, the Polish Presidency can again show leadership by working with Fiji to smooth the path to the next round of NDCs, sending clear signals that countries will enhance their climate commitments by 2020. An appeal by developing countries for accelerated climate action before 2020 in order to ensure that commitments already made are honored was an unexpectedly prominent issue in Bonn. Developing countries called on developed countries to deliver on pledges made around both emissions reductions and mobilization of finance. Similarly, the need for developed countries to complete ratification of the second commitment period of the 1997 Kyoto Protocol, which concludes in 2020, was highlighted. Delegates reached common ground by agreeing to special stocktaking sessions in 2018 and 2019. Research shows that global emissions need to peak and start to decline significantly by 2020 to have a chance of keeping global temperature rise well under 2 degrees C (3.6 degrees F), and thus ward off the most dangerous climate impacts. Immediate action is of paramount importance. As climate change intensifies, so will the consequences for the world’s poorest and most vulnerable people. Negotiators made only procedural decisions on the adaptation-related mandates of the Paris Agreement. Next year will be critical for important substantive issues, such as how to recognize what developing countries are doing to adapt, how all countries will assess adaptation actions and support, and how they will seek to mobilize more support. Recognizing that loss and damage will still occur even if countries do more to reduce emissions and adapt, Parties acknowledged the important work of the Warsaw International Mechanism on Loss and Damage (WIM) in exploring issues such as displacement, extreme weather events and slow onset events. They also asked WIM’s Executive Committee to convene an expert dialogue in 2018 (coined the “Suva Dialogue”) to explore ways to enhance support for loss and damage, including finance. Germany, Sweden, Italy, Belgium and its southern region of Wallonia, and Ireland made $185 million in new financial pledges to the Adaptation Fund and the Least Developed Countries Fund, which will support urgent adaptation needs in vulnerable countries. Negotiators agreed that the 10-year-old Adaptation Fund will be formally linked to the Paris Agreement next year, giving clarity on its future. In addition to adaptation finance, negotiators grappled with the key question of how countries would communicate about future financial support – both ex-ante as well as ex-post – for climate action in developing countries. Negotiators agreed to allow additional time to discuss these issues in the preparatory sessions between now and the 2018 climate summit. The most inspiring voices at COP23 came from city, state and business leaders from around the globe. We heard from companies like HP, Mars and Walmart, which are among the more than 320 major companies that have committed to or already set science-based emissions reduction targets. Mayors shared what they are doing as part of the Global Covenant of Mayors for Climate and Energy, which brings together 7,500 cities and local governments with the potential to reduce 1.7 billion tons of emissions. Governors showed they were ready to lead on the global stage no matter what obstacles stand in their path. This was especially true for non-federal actors from the United States. 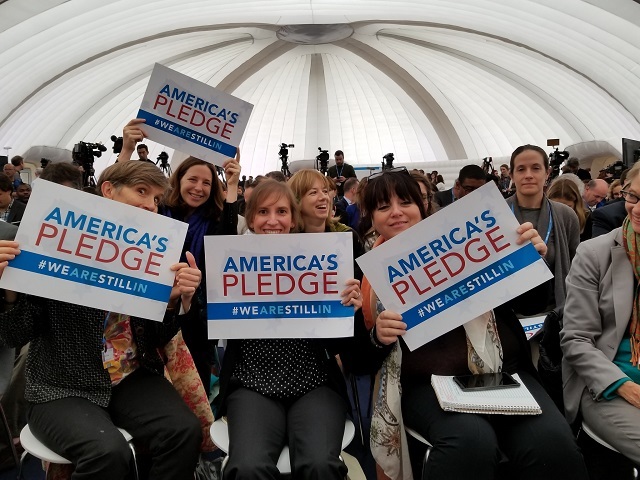 The America’s Pledge report shows that U.S. states, cities and businesses – representing more than half the U.S. economy and population have stepped up to fill the void left by the Trump administration’s stated intention to pull out of the Paris Agreement. Taken together, these states and cities alone would be the 3rd largest economy in the world. 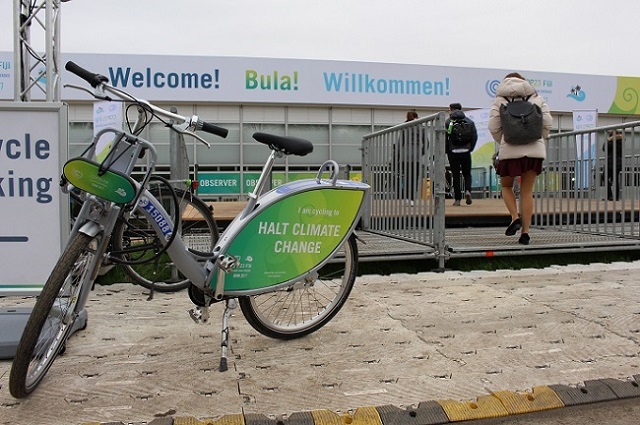 The Trump administration was soundly criticized for using its single official event at COP23 to pitch universal access to fossil fuels as a sound climate strategy. During the negotiations, Syria joined the Paris Agreement, making the United States the only nation on Earth not on board with the global accord. Countries also focused on important issues that link climate action to people’s lives. They adopted a plan to advance gender equality, and operationalized the Local Communities and Indigenous Peoples Platform created in Marrakech last year, which recognizes how indigenous peoples can contribute their knowledge to advance climate action. Both outcomes promote human rights and a just transition toward a low-carbon, climate-resilient society, but institutional arrangements and budgets are needed to get these initiatives off the ground. After years of gridlock, negotiators also made a breakthrough on agriculture-related climate issues. Countries agreed to shift from talk to action and support solutions such as improving soil carbon and soil health, promoting better livestock management practices, and ensuring sufficient food supplies in the face of climate change. This could also result in recommendations to the Green Climate Fund to finance agriculture-related activities that curb emissions and better adapt to climate impacts. What Needs to Happen Now? While negotiators made progress, it will be no small task for them to finalize the Paris rulebook next year and build political will to enhance NDCs by 2020. The good news is there will be many occasions to rally the world to act in the year ahead, from the President of France Emmanuel Macron’s “One Planet” summit in December this year, to interim negotiating sessions and the Global Climate Action Summit in California in September next year, and beyond. The window is closing to rein in the relentless rise of greenhouse gas emissions. 2018 is the year for countries – and all of us – to step up. For more on COP23, read our full coverage. This post originally appeared on WRI’s Insights. Paula Caballero, Christina Chan, David Waskow, Kathleen Mogelgaard, Eliza Northrop, Yamide Dagnet, Joe Thwaites and Rhys Gerholdt are members of WRI’s climate team.